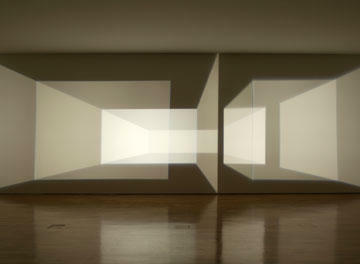 [Images: Space, sequence, light: architecture as a four-dimensional film you can walk through – taken from Reimagine (large version), 2002, by Olafur Eliasson]. I like your blog and the links you give. 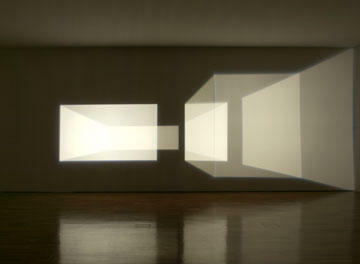 It’s projections of light onto a wall, in architectonic forms; the angles of the projections are worked out so that depth perception kicks in and then space appears to be receding into the wall in front of you – but it’s just light, at the right angles, sequenced. 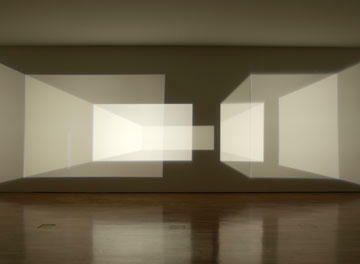 A four-dimensional film, so to speak – via a flat surface. 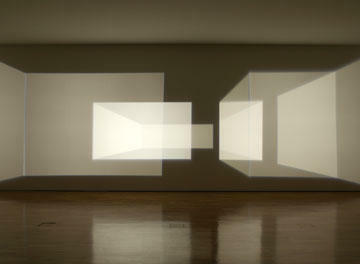 Or: space as film (light: projected). Illusions thereof. 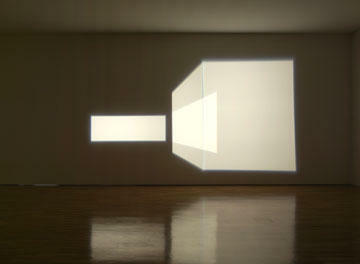 in this case, the spectrum modulated to effect various grades of white–using light to project the simulation of shadow, i.e. the absence of light.